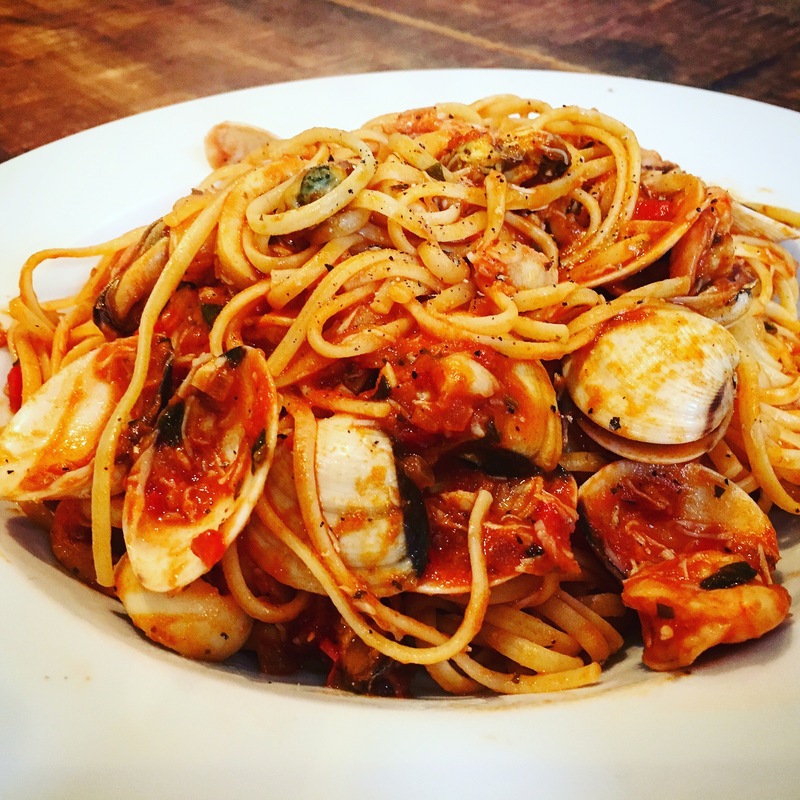 Seafood pasta is one of my favourite Italian dishes, it can be a bit hit and miss to find a decent one when eating out. This recipe I came up with gives a great full flavoured seafood bang and a rich tasty tomato sauce. 1. Finely chop the onion/garlic/chilli/herbs. 2. Heat some olive oil in a large frying pan. 3. Add onion, some salt, pepper, paprika and celery salt to pan. 4. When the onions start to soften add the chilli. 5. When the onion and chilli are soft add the garlic and herbs. Simmer for 30 seconds or until the garlic is just soft and aromatic. Don’t burn the garlic. 6. Add the tomato purée, stir through and simmer for a couple of minutes. 7. Add white wine and reduce the sauce by 3/4. 9. Boil the water for the linguine. 10. Lave the sauce simmer until thick and rich. 11. While the sauce simmers shell and de-vein the prawns (if you want them out of their shells, alternatively you can leave them whole and peel after serving). Slice the squid into rings, wash the mussels and clams. 12. Add all the seafood except crabmeat. 13. Salt the boiling linguine water then add the pasta, if using dried pasta you’ll need to put your pasta in at around stage 11. 14. Add the crab meat, stir through and cook for around 2 minutes. 15. Drain the pasta and add to the seafood/tomato sauce pan and stir through, make sure you coat all of the pasta with the sauce and then serve.